Home / Income Tax / Which ITR need to choose for filing Income Tax Return? 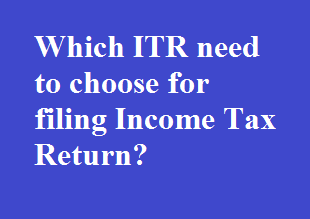 Which ITR need to choose for filing Income Tax Return? Do you know which ITR you need to choose to file your Income Tax Return? Here is how you should choose the right ITR form to file your income tax returns. Filing your income tax return isn't as cumbersome as it once was. You have four different forms to choose from for the purpose, depending on your source of income and whether or not you are a resident of the country. But knowing which form to choose -- ITR 1, ITR 2, ITR 3, ITR 4 -- is important. All of them are described in detail below. This form can only be filed by an individual who is a resident in India and has an income of up to Rs 50 lakh under any of the following heads -- 'salaries', 'income from house property' and 'income from other sources'. The form can only be used if you own only one house, self-occupied or let out. It is interesting to note that although you cannot use this form in case you have any taxable income under the head 'capital gains', you can use it in case you have long-term capital gains on equity shares and units of equity-oriented funds, both of which are exempt under Section 10(38) of the Income Tax Act. Who cannot use ITR 1? Since this form can only be used by an individual, HUFs and other tax paying entities cannot use it. Likewise, anyone having income under the heads 'profits and gains of business or profession' or 'capital gains' cannot use the ITR 1. Those whose taxable income exceeds Rs 50 lakh, or who own more than one house, or have income from a source outside India, or have agricultural income over Rs 5,000, or own more than one house, cannot use this form. Moreover, if you are a resident of India and own any asset outside India, or have any interest in an entity outside India, or have the authority to sign for any account outside India, you cannot use ITR 1. So in case you have invested in shares of a foreign company or schemes offered by foreign mutual fund house, you cannot file your return using ITR 1. The same applies if you have any brought forward losses, or have losses for the current year that you wish to carry forward. So even if you have only one property, for which you have availed a home loan, and which is let out, you still cannot use ITR 1 if the loss computed under the head 'income from house property' exceeds Rs 2 lakh, as only loss of up to Rs 2 lakh can be set off against other income.Any unabsorbed loss has to be carried forward. Also note that if you have won a lottery or have any income from a horse race in the last year, you cannot use the form to file their return. Tax payers wishing to claim relief in respect of double taxation under Section 90 or 91 also cannot use ITR 1.
Who can use ITR 2? This form can be used by both individuals and HUFs, unlike the ITR 1, which can only be used by an individual. ITR 2 can be used in case you have income taxable under the head 'capital gains' in addition to income under heads 'salaries', 'income from house property' and 'income from other sources'. Moreover, you can use ITR 2 if your agricultural income exceeds Rs 5,000, unlike with ITR 1. The same applies for if you have any source of income from abroad. Resident individuals who own any asset or have interest in any asset located outside India, or have the authority to sign for any account situated outside India can also use this form as long as they do not have any income under the head 'profits and gains of business or profession'. ITR 2 can be used if you wish to avail rebate for taxes paid in any foreign country on any foreign income earned outside India under Section 90 or 91. It can also be used in case of losses brought forward or losses for the current year under any head except 'profits and gains of business or profession'. If you own more than one house or have income from lotteries or horse races, you can use ITR 2.
Who cannot use ITR 2? Only individuals or HUFs who have income under 'profit and gains of business or profession' cannot use this form. ITR 3 can be used by any individual or HUF who has any taxable income under the head 'profits and gains of business or profession'. This form, however, cannot be used in cases where taxes are required to be paid on a presumptive basis. There is a separate form for that purpose. This form, commonly called Sugam, can be used by any individual, Hindu undivided family (HUF) or firm but not by an limited liability partnership (LLP) engaged in the business or profession on which tax is required to be paid at pre-determined presumptive basis. In case you own freight trucks, this form can only be used if the total number of trucks owned by you is not more than 10 during the year and where you have to offer income on fixed basis at Rs 7,500 per month for each truck owned by you. The form can also be used by a person whose total business turnover during the year does not exceed Rs 2 crore and is willing to pay tax on net profit at 8 percent of total turnover under Section 44AD. The presumed net profit in case of business gets reduced to 6 percent in respect of payments, which have been received either through banking channels or through electronic payments including credit card. If you are engaged in specified professions covered under Section 44ADA, you can use this form if your gross receipts do not exceed Rs 50 lakh in the year, you are willing to offer 50 percent of your gross professional receipts as profits and are ready to pay tax on it. In case your income is lower than that what is presumed by the law and have to get your accounts audited, get the audit report submitted before submission of income tax return. In this situation, you cannot use this form and have to use form 3 or 5 depending on whether you are an individual or HUF.